Japan conducted its first launch of 2019 Friday, using the small Epsilon rocket to launch seven satellites, including the RAPIS-1 technology demonstration mission, into orbit. Epsilon lifted off from the Uchinoura Space Centre at the start of a nine-minute, 17-second window that opened at 09:50:20 local time (00:50 UTC). 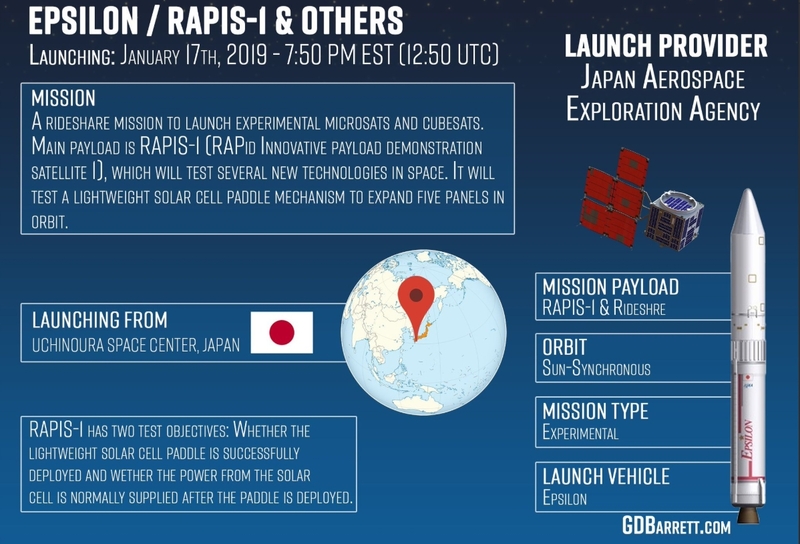 The primary payload for Friday’s launch was the Rapid Innovation Payload Demonstration Satellite, RAPIS-1, for the Japan Aerospace Exploration Agency (JAXA). Also known as the Innovative Technology Demonstration Satellite, this spacecraft aims to test components in orbit for potential use on future missions. The 200-kilogram (440-lb) satellite is cube-shaped, with sides of one meter (3.3 feet), and was constructed by Axelspace in conjunction with JAXA. RAPIS-1 will operate in a sun-synchronous orbit. RAPIS-1 will operate for at least one year. In that time, it will test several technologies in orbit. These include a nanobridge-based field-programmable gate array (NBFPGA) which will be evaluated for use in future integrated circuit chips, an X-band communications payload incorporating a high data-rate transmitter and medium-gain antenna and a reaction control system for maneuvering the satellite which uses more environmentally-friendly propellants. Other experiments include a particle monitor and star trackers that incorporate deep machine learning to ascertain the attitude of the satellite. Fireant is a miniaturized low-power receiver that will use signals from navigation satellites to track RAPIS-1’s position in orbit. Finally, the satellite will be powered by prototype lightweight solar arrays, consisting of five lightweight panels mounted on a deployable paddle which will be extended once RAPIS is in orbit to generate around 100 watts. Six small satellites were accompanying RAPIS-1 during its ascent on Friday. These included Astro Live Experiences 1 (ALE-1), a 68-kilogram (150 lb) spacecraft for Japanese company Astro Live Experiences which will be used to generate artificial meteor showers. The satellite will eject small pellets into the atmosphere – each measuring about a centimeter (0.4 inches) in diameter – which will burn up over a designated area for the enjoyment of spectators. ALE-1 is a prototype, intended to demonstrate the concept before larger satellites are launched to offer this service in the future. Hodoyoshi-2, also known as the Rapid International Scientific Experiment Satellite (RISESAT), is a 50-kilogram (110-pound) satellite flown for an international research consortium led by the University of Tokyo. It carries a high-precision telescope to study how the Earth reflects sunlight, two cameras to record transient luminous events (TLEs) – a phenomenon in Earth’s upper atmosphere – and to study the surface of the oceans. Hodoyoshi-2 also incorporates a magnetometer, radiation detectors, a dosimeter and an optical communications experiment. In addition, the satellite will be used to collect and relay data from environmental monitoring stations. The Vietnam National Satellite Centre’s MicroDragon is a 50-kilogram satellite built to study Vietnam’s coastal regions, collecting data to help determine the quality of the water, locate regions to fish, and monitor changes in the country’s coastline. The other three satellites aboard Epsilon were CubeSats. OrigamiSat-1 was built to the three-unit CubeSat standard by, measuring 10 by 10 by 34 centimeters (3.94 by 3.94 by 13.39 inches) undeployed. The satellite will be operated by the Tokyo Institute of Technology. Once in orbit, OrigamiSat will test deployment of a structure with a membrane, observing its behavior as it deploys and its final shape. The satellite is also equipped with an amateur radio payload. Nihon University’s NEXUS satellite is a single-unit CubeSat which is equipped with a camera and an amateur radio transponder. The satellite’s objective is to demonstrate its amateur radio system, which is anticipated to allow a faster relay of data than comparable existing satellites. The Aoba VELOX IV satellite is a two-unit CubeSat which was jointly developed by Japan’s Kyushu Institute of Technology and Singapore’s Nanyang Technological University. Aoba VELOX IV will test in Earth orbit a camera intended to study lunar horizon glow – a phenomenon where a glowing light has been observed shortly after sunset over the Moon’s surface. Once demonstrated, a similar camera could be sent on a future mission to study this glow from lunar orbit. Aoba VELOX IV will also test pulsed plasma thrusters, and relay telemetry on its subsystems to the ground for evaluation. 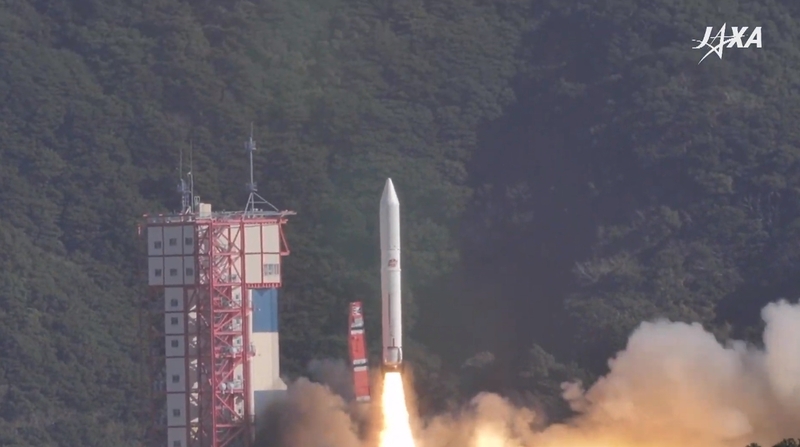 Friday’s launch was the fourth flight for Japan’s Epsilon, which was introduced in 2013. The launch took place a year to the day after the rocket’s third flight, which deployed the experimental ASNARO-2 radar imaging satellite on 18 January 2018 (17 January in UTC). Epsilon was developed as a successor to the earlier Mu series of rockets, which Japan used to launch its smaller science and technology satellites. The last member of the Mu family, the M-V, was retired in 2006 with foreign launches and rideshare opportunities on the larger H-IIA rocket used to cover the gap before Epsilon’s debut. Epsilon was designed to leverage existing components, combining the upper stages of the M-V with a first stage derived from the SRB-A3 boosters used on the H-IIA, although from its second flight onwards upgraded versions of the M-V stages have been used. At its core, the Epsilon rocket is a three-stage solid-fuelled vehicle, however it can also fly in a four-stage configuration with the Compact Liquid Propulsion System (CLPS). This restartable liquid-fuelled upper stage can provide an extra impulse to the rocket’s payload and ensure delivery to a precise orbit. CLPS will be used in conjunction with Epsilon for Friday’s launch. Epsilon launches take place from the Mu Centre, a launch complex of the Uchinoura Space Center which was originally built as a rail launcher for the Mu series of rockets. After the retirement of the M-V, the pad was converted to allow Epsilon to be launched vertically, with the former launch rail remaining in place to serve as an umbilical tower. At the zero mark in Friday’s countdown, Epsilon’s first stage ignited, and the rocket lifted off to begin its climb toward orbit. Its SRB-A3 motor burned for 108 seconds, accelerating Epsilon to a speed of 2.3 kilometers (1.4 miles) per second. After burnout, the rocket coasted – shedding its payload fairing 43 seconds later at an altitude of 151 kilometers (76 miles, 66 nautical miles). Ten seconds after fairing separation Epsilon’s spent first stage was jettisoned, with second stage ignition occurring four seconds after that. Epsilon’s second stage is an M-35, derived from the M-34 that made up the third stage of the earlier M-V rocket. M-35 powered Epsilon’s flight for 129 seconds, before another 96-second coast to separation. The third stage, KM-V2c, began its burn four seconds after second stage separation, firing for 88 seconds. KM-V2c is derived from the KM-V upper stages that were used in conjunction with the M-V. The third stage and CLPS separated from each other 112 seconds after burnout, however the upper stage did not ignite for another 285 seconds. CLPS performed a complex seven-burn mission to deploy each of Epsilon’s payloads into their prescribed orbits, ensuring adequate separation between them. The first burn lasted five minutes, and after a 23-minute, 38-second coast a six-minute, 32-second burn put the stage in the correct orbit for RAPIS-1. Spacecraft separation came 126 seconds after the end of the second burn. With RAPIS-1 successfully deployed, CLPS waited nine minutes and 16 seconds before performing a 17-second burn. Hodoyoshi-2 was deployed 112 seconds after this burn is complete. Twenty-three seconds later the fourth stage performed a three-second burn and 74-second coast before deploying MicroDragon. After another 24 seconds, a two-second burn followed by a seventy-four second coast to provide spacing to deploy OrigamiSat. The cycle of twenty-four second coast, two-second burn and seventy-four second coast was repeated for the next deployment, which saw NEXUS and Aoba VELOX IV both separate. Twenty-three seconds later CLPS began its final burn, firing for four seconds and deploying ALE-1 seventy-three seconds after the burn’s conclusion. Friday’s launch was Japan’s first of 2019, following on from a year in which the country conducted six successful orbital launches. It is the first Epsilon launch in exactly a year and is currently expected to be the rocket’s only flight in 2019 – with its next mission slated for 2020 with a further demonstration satellite. 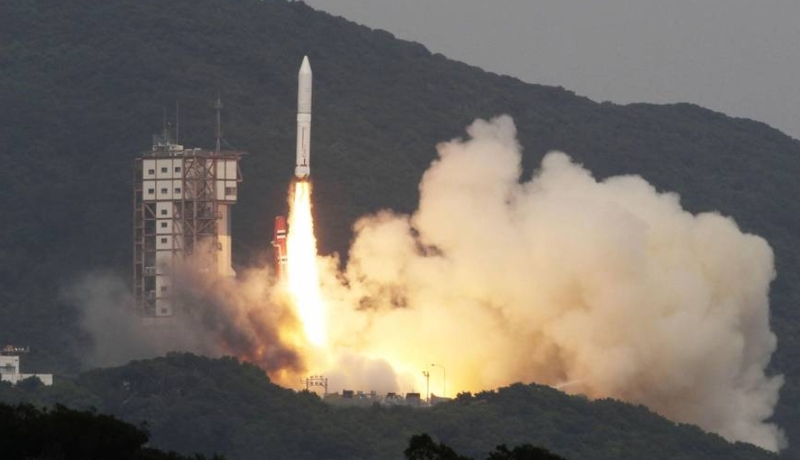 Japan has not yet announced a date for the country’s next satellite launch. 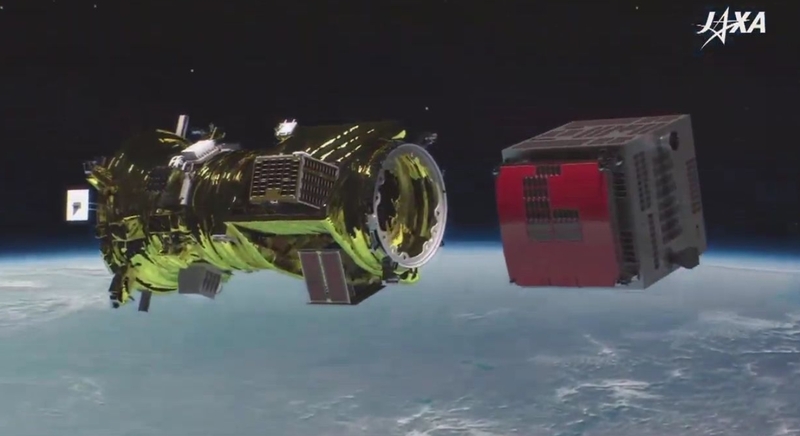 However, several are expected later this year including the deployment of data relay and Information Gathering Satellite (IGS) reconnaissance spacecraft via H-IIA vehicles and the HTV-8 (Kounotori 8) resupply craft to the International Space Station aboard an H-IIB.